Aeromiltec CSU-13B/P is a U.S. Air Force Anti-G suit worn by fighter aircraft pilots to counteract positive head to foot G forces. 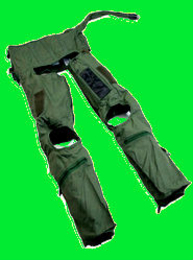 It is a wraparound garment with an internal inflatable bladder which compresses the waist and legs of the wearer during G induced flying maneuvers.The Anti-G Suit consists of a Nomex aramid cloth outer shell which houses a bladder. The bladder system is constructed of polyurethane coated nylon and covers the abdomen, thighs and calves. 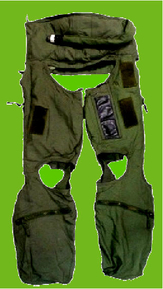 The AeromiltecAnti-G Suit, CSU-13B/P, consists of a fire-resistant sage green aramid cloth outershell which houses a bladder. It is cut away at the buttocks, groin and knees. 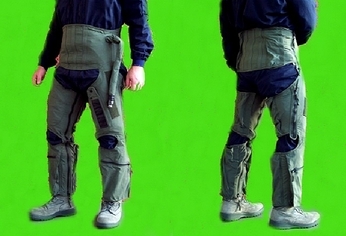 The outer shell has waist and leg entrance slide fasteners, six adjustment lacing areas with lacing covers, and two easily detached leg pockets with slide fastener closures. The inner bladder system is constructed of polyurethane coated nylon and covers the abdomen, thighs and calves. The bladder system is fitted with a hose for connecting directly to the aircraft Anti-G system. 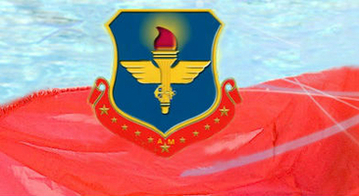 The AeromiltecCSU-13B/P is fitted and adjusted to the aircrew on a best-fit basis. The cords shall be laced in the same direction as the applicable lacing cover slide fastener closure. 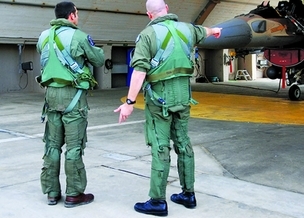 The CSU-13B/P is fitted and adjusted to the aircrew on a best-fit basis. The cords shall be laced in the same direction as the applicable lacing cover slide fastener closure.